Whether you adhere to the rigid discipline of the First Order, rebel against the tyranny of the Empire, or come from a family of powerful Force users, you will be able to display your personal style in your games of Star Wars™: Destiny. Fantasy Flight Games is happy to announce three new Star Wars: Destiny Dice Binders! You can pre-order these dice binders at your local retailer, or you can click the product names above to place your pre-order through our website. With room for 44 dice and 44 sleeved cards, these custom Dice Binders feature some of the Star Wars galaxy’s most iconic characters while offering convenient storage and protection for your Star Wars: Destiny deck. What’s more, the binder’s plastic trays display every die individually in rows, making them easy to identify and access. All you need to do is pull the die you need as soon as your card is played! On the outside, each binder reflects your personal style while safely maintaining the mystery of your deck and dice between games. You could impose the authority and order of Captain Phasma on your deck, displaying your dice in crisp, clean rows. Or, you might channel Jyn Erso’s rebellious streak, packing your deck full of cards that allow you to follow your own agenda. Finally, you could shoulder the hopes of the galaxy, hoping the Force will be with you as you roll the dice with Luke Skywalker. 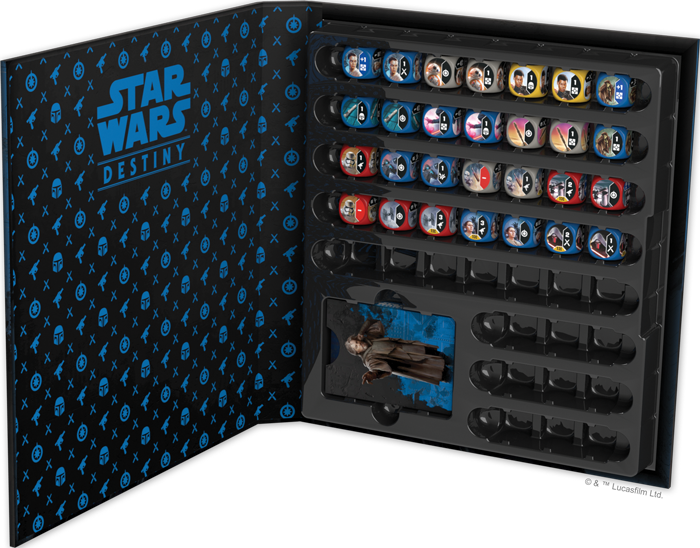 Each of these characters is an iconic part of the Star Wars saga, and their Dice Binders empower you to represent your strength, cunning, and spirit in all your games of Star Wars: Destiny. Star Wars: Destiny invites you to create your own dream collection of characters, vehicles, and items from throughout the saga and put them to the test in epic battles. These upcoming Dice Binders take you one step further, offering a convenient way to store and transport your favorite decks and dice. These Dice Binders are scheduled to arrive in the third quarter of 2018. Head to your local retailer to pre-order yours today, or place your pre-order online through our webstore!